The 2019 Dodge Durango is an all impressive three-row crossover SUV delivering adult-sized space in the third row, amazing towing capacity, and available V8 power. The Durango is extremely well rounded with high tech features, a comfortable interior, and a trailer tow package. The 2019 Dodge Durango comes in five trim levels: SXT, GT, Citadel, R/T, and SRT. The SXT, GT, and R/T trims come standard with seven-passenger seating, while the Citadel and SRT come standard with six-passenger seating thanks to the second-row captain's chairs. Keep reading to learn exactly what features comes with each trim. The base SXT comes with 60/40-split folding and reclining second-row seats, a 50/50-split folding third-row seat with power-folding headrest, a leather-wrapped steering wheel, cloth upholstery, keyless ignition and entry, load-leveling rear suspension, heated mirrors, foglights, a back up camera, three-zone automatic climate control, Android Auto, Apple CarPlay, a 7-inch touchscreen, Bluetooth, two USB ports, and a six-speaker sound system. The GT builds upon the SXT to add an auto-dimming rearview mirror, remote ignition, rear parking sensors, power lift gate, 20-inch wheels, LED foglights, a 115-volt power outlet, an eight-way power driver's seat, and a new hood. The Citadel trim comes with automatic wipers, automatic high beams, power-folding mirrors, front parking sensors, upgraded brakes, roof-rail crossbars, cargo cover, a sunroof, heated front and second-row seats, leather and vinyl upholstery, a six-way power passenger seat, driver-seat memory, an 8.4-inch touchscreen, navigation, HD radio, and a nine-speaker Alpine audio system with a subwoofer, and a technology package. An optional Anodized Platinum appearance package includes special interior trim and upgraded leather upholstery with silver accent stitching. The R/T focuses on high performance with upgraded brakes, upgraded steering, a performance hood design, a lowered ride height, leather and simulated-suede upholstery, LED foglights, and a nine-speaker Alpine audio system. A technology group package adds blind-spot and rear cross-traffic warning, a forward collision warning system with automatic braking, adaptive cruise control, lane keeping assist, and lane departure warning. Options for the R/T include a trailer-tow package, a second-row console with an armrest and storage, a dual-screen rear entertainment system, and black running boards. Building upon the high-performance features of the R/T is the SRT. Features in this model include upgraded leather and simulated-suede upholstery, upgraded Brembo brakes, performance-tuned steering, an adaptive high-performance suspension, auto-leveling headlights, high-performance suspension, ventilated front seats, and electronically controlled limited-slip differential. Options for the SRT include a sunroof, appearance group, full leather upholstery, technology group, rear entertainment system, and the lightweight performance package that removes the third-row seats. 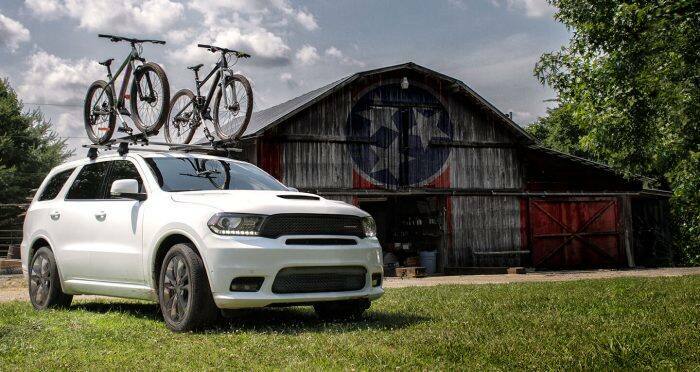 Whether you need to pack the car full for a road trip, get to work, or travel on a day with bad weather the 2019 Dodge Durango has your back. With five different trims, several packages, and endless standalone options you're sure to find a Durango perfect for your needs. Shop our inventory of 2019 Dodge Durango's here. Decisions can be hard but we are here to help! Stop by the dealership today to talk with one of our friendly sales associates!